Immaculate Heart of Mary come soon! I prayed this morning at Holy Mass for all the priests of Malta, both the courageous and the less courageous, that they may be given the wisdom and fortitude to resist the poor judgement of their bishops; to hold to the truth of the Sacrament of Marriage so clearly taught by Our Lord; to proclaim and counsel its practice insistently, so as to give sinners a true sense of the need for penitence; and to steadfastly withhold the Sacrament of Holy Communion from public sinners, in all charity, so as to prevent sacrilege, scandal, and the ruin of souls. Perhaps we should consider making a Novena for this intention. As Fr Hunwicke has remarked with regard to today's TLM Gospel of the Wedding Feast at Cana: Her Immaculate Heart *will* prevail. And it also occurs to me, looking at rarely-visited confessionals and pondering the treacherously seductive quarter-truth that 'the Eucharist is medicine for the soul, and not a reward for the just': it depends - of course! - on the state of the soul, which if going to Communion in a state of sin 'eats and drinks damnation unto itself'. That is no empty phrase but an eternal verity. To be forced to abstain from Holy Communion at Mass can be a salutary reminder to the conscience of the need for repentance, and of the precious worth of the Sacrament; at least, however sinful, we are still witnessing the miracle of Christ's Presence on the altar. Who knows the mercy and love of God in such a situation: at least we are showing Him some obedient humility. But to compound our sin with a blasphemous reception of the Eucharist is infinitely more serious, and endangers our soul for ever. It is of course Confession that is medicine for the soul, not Holy Communion. To abstain for a long time from Confession and remain in a permanent state of sin may gradually deaden the soul and risk our eternal damnation if we should die before confessing. With all sympathy for those in 'difficult situations', it is an act of charity for our priests to remind us of these immutable truths, in and out of season. I wish they would, more frequently and in the pulpit. There is no 'nice' way of putting them. The Four Last Things are not at all 'nice'. The Tudor equivalent of the English and Welsh Bishops' Conference clearly decided for Henry (with one suicidal exception). You can't say fairer than that can you? Democracy and collegiality in action. Same in Malta - don't rock the boat, safety in numbers, don't lose your heads/careers when you know what the boss wants, that would be silly, wouldn't it? Ah, but which little bird ordered them all to do it right now, to declare a doctrinal error all together in a remarkable show of unity, and so coincidentally hot on the heels of PF's attempt to try to take over the Knights of Malta, and so hurt their Cardinal Patron? 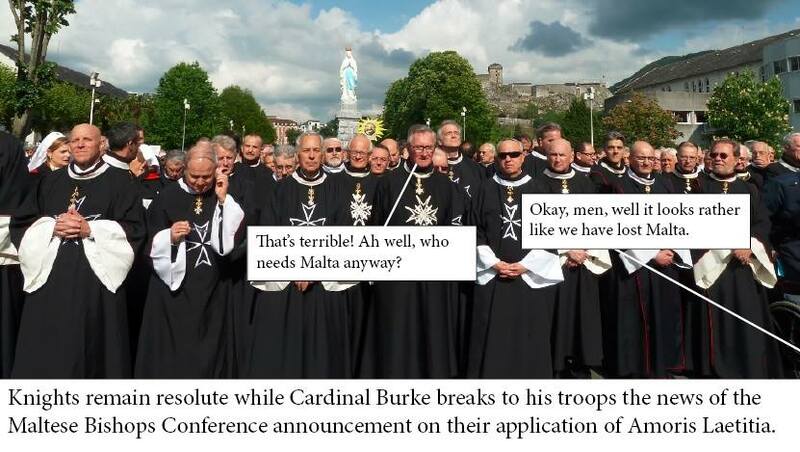 Were the Maltese bishops all suddenly animated last week by a rush of national episcopal zeal to lead the souls in their care to perdition? or were they told via a direct line from Rome: Do it, do it now, or else! 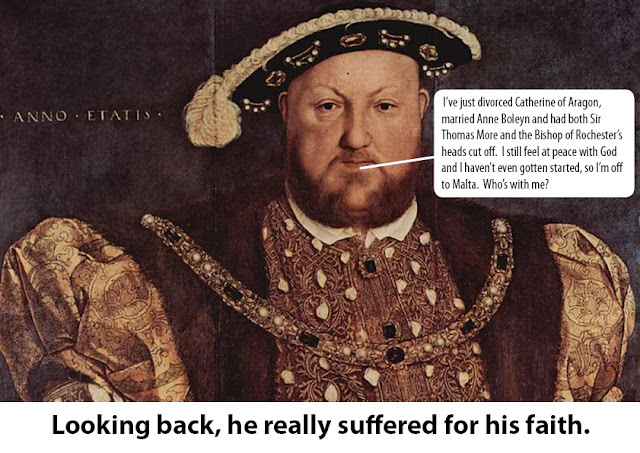 It's long past time for Catharine of Aragon to be declared a Saint of the Church. Perhaps someone in England reading this knows how to get the process started. This is the perfect moment. The lady could be the patron saint of abandoned spouses everywhere. Catharine's Feast Day ideally would be May 23rd - the day that Cranmer declared her marriage to Henry null and void.